I have always been gobsmacked by that NAB bank. Thank you for you great posts, full of insight, and history and affection. Thanks Julie – I do indeed feel affectionate towards this strange building! Excellent story on DB. 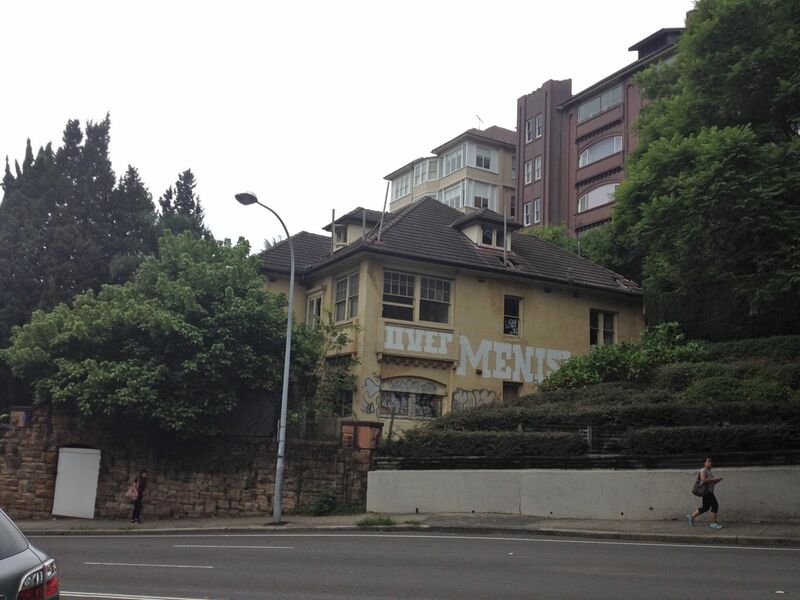 Always wondered about those derelict mansions, they just cry out from another era of the 1930s and 40s. Thanks. Thanks Suzanne – yes those mansions are striking in their abandoned state, although it seems they won’t be there much longer as the development plans gather speed. Thanks Vanessa. A beaut bit of research and comment. 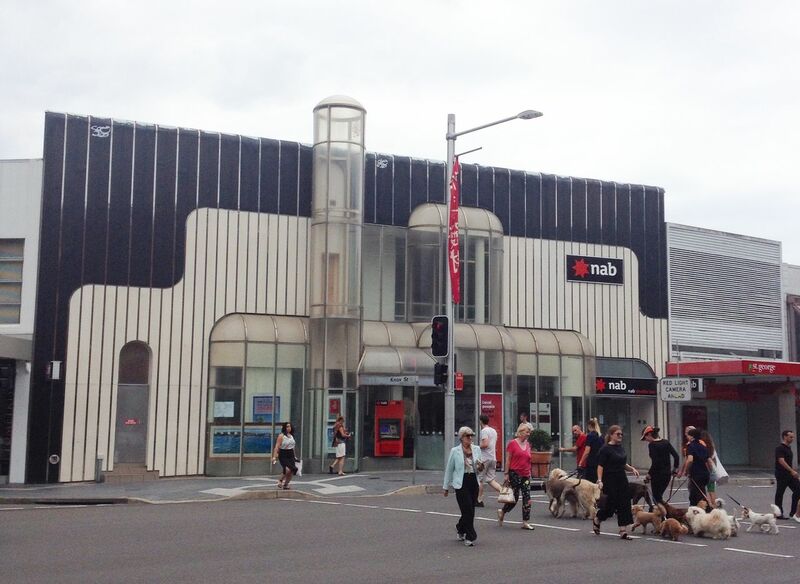 The photo of the NAB with all of those Double Bay dogs crossing the road with their walkers is so Double Bay. It sure is – I felt like I was there at a lucky moment when all those dogs were going across, but then I realised that scene probably happens quite often. Made the trip to Double Bay. I don’t explore East side very often. I imagine disapproving stares of posh people who instantly recognize a Bankstown Boy in their midst. That said I witnessed some amazingly bogan behaviour. Waiting to cross at the lights I saw a tattooed ankle hanging out the window of a Mercedes 4WD. I noticed that the drivers honk their horns angrily, not because of clueless drivers still sitting at the lights but because they were in a hurry and wanted someone out of the way. It is quite stuck in the past as well. The shops had a very 1070’s feel to them, not in a derelict way, but I would of imagined the shopping strip to have been more frequently updated. I’m also guessing Bondi Junction Westfield has had an impact on Double Bay. Good to hear you went exploring the east Ash! Yes I think the opening of the Westfield had a big impact on Double Bay – I found a few references to a decline in the DB shopping district when Wesfield opened around 2003. I too am not as familiar with the east as other parts of Sydney. There are some interesting old places I will have to return to and explore further. So much to explore! I look forward to seeing some of your eastern suburbs photos. Loved the you tube clip – good to know those cards can’t be forged! I’ve been trying to work out what the funnel is on the front of the building – is it a lift shaft? Or a precursor to the atm as you suggest? I don’t know about the funnel, it’s a mystery! If I had to guess I’d say a lift shaft – there is a door on the first floor of the tube – I’ve never known there to be a lift in there, though. I will see if I can get to the bottom (or the top) of it! 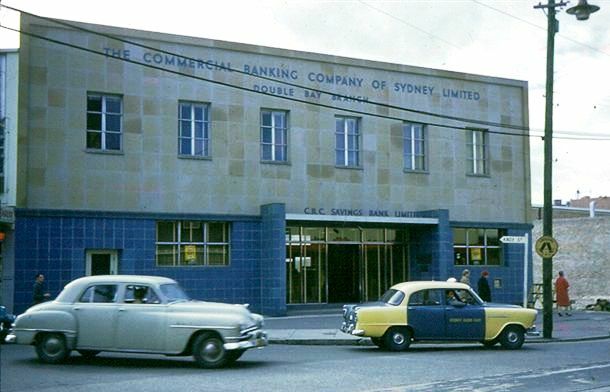 Speaking of old school Double Bay – DB used to be THE place for great second hand bookshops in the 1970s, 80s and 90s. There were at least 4 or 5 close together. I used to browse for hours in my younger years. I want to go back in time and browse! I saw a building in Parramatta that met a similar fate– random items from a household for sale in an empty glass shopfront, hand-drawn signs. I think that this is some loophole to show that the building is technically being used as a business? Some sort of tax break?